Life is full of meaningful moments that can be expected and planned or totally unanticipated. The anniversary of when a congregation was established is a major event to celebrate. 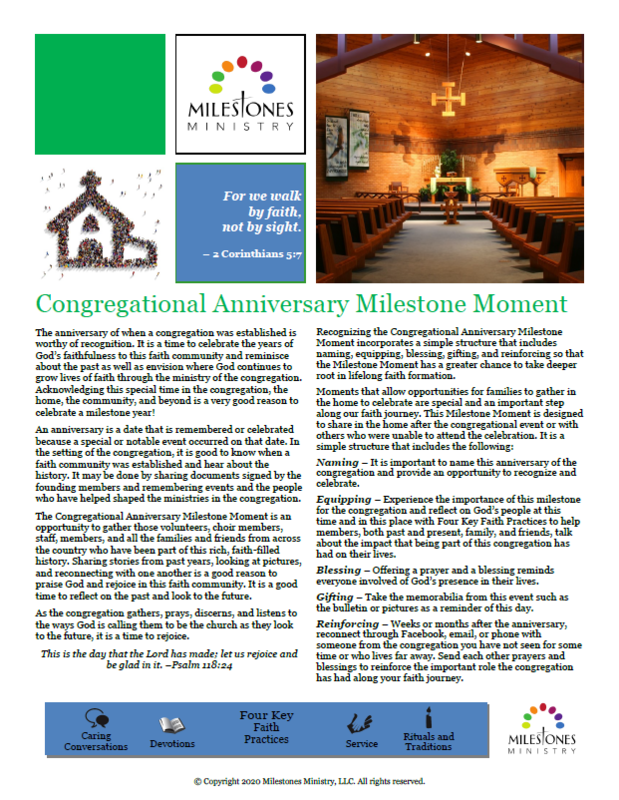 This Congregational Anniversary Milestone Moment supports the important experience of celebrating a congregational anniversary by creating faith-filled memories in the home after the public events have been concluded. Congregational anniversary memories can be reinforced and strengthened with faith, hope, and love by gathering with family and friends in the more intimate setting of the home. This milestone moment encourages personal storytelling as well as a communal reflection on the past history as well as envisioning where God continues to grow lives of faith through the ministry of the congregation. his Milestone Moment includes the Four Keys for practicing faith outline which encourages growing in our faith by recognizing the home and family gatherings as church, too. A simple five-step structure is also included to establish a solid base for faith formation. These blank pottery stones are individually hand-crafted and available at a low cost to purchase and gift as meaningful reminders of this Milestone Moment. They can be marked with permanent marker to personalize with a drawing, words, or numbers relating to the congregational anniversary. They are wonderful keepsakes to honor and remember this day.